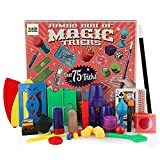 TEN CLASSIC TRICKS: This set features 10 magic tricks, including Disappearing Ball, Magic Coin Box, Secret Silks, Great Escape, Magic Number Prediction, Money Maker, Egyptian Prediction, Vanishing Zone, Cylinder Squeeze, and Vanishing Coin. STURDY CONSTRUCTION AND EASY STORAGE: The sturdy solid-wood construction and the beautiful artwork make this a special kids magic set. Use the hinged box to store materials and to serve as a performance space. This fantastic set includes 10 professional caliber, yet easy-to-master, tricks for beginners! Young magicians will improve their confidence and fine motor skills as they amaze family and friends with exciting tricks and illusions! "Secret Silks," "Magic Number Prediction," “Egyptian Prediction” are among the ten classic tricks included. Say the magic word and this fabulous set can be yours! The process of preparing and performing their magic act is ideal for building confidence and poise, as well as exercising creativity and dramatic flair as they take the stage to perform. Sturdy wooden pieces, thick-woven rope, and shatterproof mirrors mean this high-quality set is built to stand up to countless “rehearsals.” The classic nature of the tricks also means they won’t seem stale or babyish as kids grow. They’re sure to be loved for years to come. Children will get a kick out of seeing the very same acts performed by “real” magicians at professional magic shows. The Melissa & Doug Deluxe Magic Set makes an ideal gift for kids ages 8 years and up. Add the Melissa & Doug Discovery Magic Set to inspire hours of hands-on, screen-free play. Ideal Magic Spectacular Magic Suitcase lets children wow their audiences and amaze even themselves! Learn the great secrets of illusion from one of the most complete magic sets ever made. 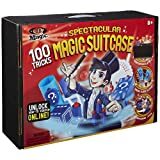 This set comes with a magic hat, magic wand, suitcase that doubles as a magician's table, props, instructions and codes for online videos starring magician Ryan Oakes. Props include a magic drawer box, 3 plastic cups, 4 fuzzy balls, double-sided lollipop, clear quarter box with lid, coin container with top, dice escape (3 parts), 3 red plastic balls, red half ball, 6 multiplying rabbits, ring, ring with false bottom, rabbit ring mat, rabbit token, spot card, number card, thumb tip, mystery card deck, crazy coin cap, flip box, 2 blue tubes, 2 clear tubes, 2 juice cans, color cube, hanky vanisher with elastic cord and double-sided tape. Recommended for children 8 years of age and older. The Magic Trick Penetrating Ball Point Pen - The Most Exclusive Penetrating Pen You Can Buy! 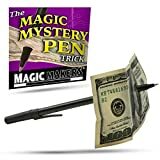 - Easy Trick to Perform - Force The Pen Through a Dollar! The Mystery Pen Deluxe is a trick sure to amaze! First show the pen and a dollar bill. Show the pen as you penetrate the bill with it. Then magically remove the pen from the bill leaving absolutely no holes or blemishes. Hand both the pen and bill out for total examination. Pen is real and can be used to write with. Try to imagine what's inside this small tin. You give it a shake and you feel there's something inside. Perhaps you may think it is a ring or a coin. But, after you look inside be ready to be fooled! This trick is so deceptive, it will even fool magicians! THIS ITEM CAN BE HANDED OUT FOR INSPECTION! A Wildly Popular Trick! This Is A Seemingly Impromptu Miracle. The Magician Displays A Quarter, And Then Takes A Bite Out Of It! The Spectators Actually See Teeth Marks In The Quarter. A Piece Of The Coin Is Missing, Apparently In The Magician'S Mouth. The Magician Then Restores The Quarter In A Flash - By Spitting The Bit-Out Portion Of The Quarter Back On To The Chunk Remaining In His Hand. In The Blink Of An Eye, The Quarter Is Whole Again! No Sleight Of Hand Is Required. Complete With Instructions That Teach You How To Perform This Feat With A Borrowed Quarter! 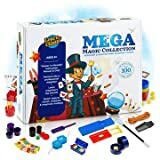 ULTIMATE KIDS MAGIC SET - Let your child be the star with 28 magic props allowing your child to perform hundreds of tricks with this ultimate magic set for kids, the largest selection of magic tricks on the market. Do you want the ultimate magic set for kids, that is easy to learn and provides endless hours of fun for your child? The Uncle Bunny magic trick set allows children to perform the most fascinating magic tricks. In no time at all, your child will delight you with their new magic tricks. Let the abracadabra’s start the smiles and remember to have your camera ready. Complete with a step-by-step instructional DVD by Master Magician Leif Davis plus an easy to follow instruction manual. Included in the Kids Magic Set is a high quality 2 Drawer Performance Table that allows easy, perfect presentation and long lasting storage. Loaded with the biggest selection of the greatest magic tricks and props for your little magician on the market. A coin magically changes into another coin. A picture that prints itself. Scary blade slides right through your finger. A card magically vanishes. Sword that Penetrates Glass, Mystery Dice, Traffic Light, Magic Wand, Illusion Box, Lighting Box, Rings and Coin, Magic Coin Case, Finger Chopper, Cups and Balls. Spiked Coin, Cut Rope, Growing Cards, Magic Ropes, Sponge Rabbits, Floating Match, Paper to Coin, Appearing Silk, Coin Escape, Foretelling Peg-Top, Rainbow Bricks, Measure the Faces, JQK Cards, Ball and Vase, Cube and Box, Magic Printing Theatre, Instructional DVD, Instruction Manual and much, much more. Perfect for Kids Ages 6+ getting into the art of magic for kids, simple to master, amazing to behold. Not completely satisfied? We’ll make it right, no questions asked. All of our products have our 30-day return policy which means you can experience your new magic box set risk-free. Click the, Add to Cart, button now and see how much your children enjoy magic tricks. Packed with the Most Popular Tricks - Looking for beginner magic kits? Ours features all the old favorites ... from magic cup & ball, card and coin tricks to the mysterious levitating wand. Easy for Beginners - No prior magic needed with our magic starter kit. What a great confidence booster. 60-Day 100% Money-Back Guarantee - Your satisfaction truly matters to us - so buy our classic magic kit set without risk. If you don't love it, we'll refund every cent you paid... no hassles. Got a budding Houdini in your life? Chock-full of favorite tricks, this magic kit will captivate your boy or girl while helping them to build critical self-esteem. Want to give your child options for play beyond the tablet or phone? Turn that rainy day into endless fun with the 3 Bees and Me Magic Kit for Kids. With 75 jaw-dropping tricks, it has all she needs to put on a magic show right at home. No need to worry if your kid is new to magic - this kit includes step-by-step instructions for performing each trick PLUS a link to online video demos and online instructions! And the more he practices, the better he'll get - and the bigger his confidence will grow. To your child, making magic is just pure fun. She won't know that she's also building hand-eye coordination and cognitive skills that will serve her well later in life. The 3 Bees & Me Magic Kit for Kids makes a fabulous gift for birthdays, christmas, holidays, and other celebrations. It's an affordable yet unique action-packed present you'll be proud to give. Ready to get your magic on? Click "Add to Cart" to buy now. A stack of 4 nickels is covered with a brass cap. When the cap is lifted, the nickels have changed into a stack of 4 dimes. 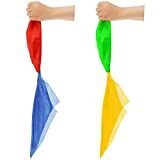 They are easy magic props for magicians of all ages and skill levels, also with bright 4 colors, can easily attract people's eyes. 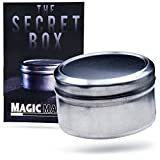 Great for street magic, home, school, party or any other occasions or you can send it as a gift.